Be the first to share your favorite memory, photo or story of Norman "Norm" J.. This memorial page is dedicated for family, friends and future generations to celebrate the life of their loved one. 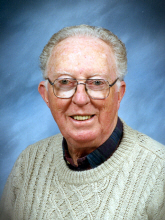 Norman “Norm” J. Charboneau, 87, of Camillus, passed away Tuesday, April 17, 2012 at Van Duyn Home & Hospital. Born in Dolgeville on Thursday, July 10, 1924, he was the son of William Ray Charboneau and Mary Frances Owen Charboneau. He lived at various times in Otter Lake, Altamont, Endwell, Syracuse and Yorktown Heights, New York, and Passaic, New Jerseu and Wilmington, Delaware before moving to Camillus in 1989. He was a Navy veteran of World War II. Norm graduated from Clarkson University with a bachelor’s degree in engineering. He was employed for 24 years with General Electric in Binghamton and 11 years with Technicon Instruments Corp. in Tarrytown, retiring in 1989. He received a senior quality engineer award from the American Society for Quality Control and was a chairman of the Binghamton section. A communicant of St. Joseph's Church, Norman served as a Eucharistic minister. Surviving are his wife of 63 years, the former Margaret “Peg” Laurence; daughters, Molly of Sunnyside Queens, Amy of Elbridge and Carol of Wallingford, Connecticut; sons, Mark of Fayetteville and Jeffrey of Syracuse; eight grandchildren; seven great-grandchildren and several nieces, nephews and cousins. Relatives and friends may call Friday, April 20 from 4 to 7 p.m. at the Buranich Funeral Home, 5431 W. Genesee St., Camillus. A funeral Mass will be celebrated at 12:30 p.m. Saturday, April 21 in St. Joseph’s Church, Camillus. Burial will be private in Greenlawn Cemetery, Warners. In lieu of flowers, contributions may be made in Norm’s memory to St. Joseph's Food Pantry, 5600 W. Genesee St., Camillus, NY 13031. To send flowers or a remembrance gift to the family of Norman "Norm" J. Charboneau, please visit our Tribute Store. "Email Address" would like to share the life celebration of Norman "Norm" J. Charboneau. Click on the "link" to go to share a favorite memory or leave a condolence message for the family. memory of Norman "Norm" J.